One of the earliest photographs taken of me and my parents is of the three of us in front of Chicago’s First Korean United Methodist Church. 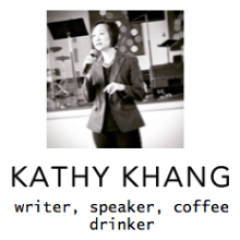 I grew up in the Korean/Korean-American immigrant church. It was at church where I took Korean language classes. Where I learned Korean folk dancing. Where we spent many Christmas Eves waiting for Korean Santa to show up while many of us were dressed in our Korean dresses and Sunday best, and where we spent New Year’s Eves to the smells of rice cake soup and the sounds of four wooden sticks being thrown up in the air in a lively game of yoot. Where I learned to say the Lord’s Prayer in Korean before I knew it in English. Where I learned to sing hymns and read the liturgy in Korean before I would learn the meaning behind the words. But also learned about leaving. Elders’ meetings going on for-e-vah. Phonecalls. More meetings. Angry words. More angry words. Churches splitting, leaders resigning, families leaving. 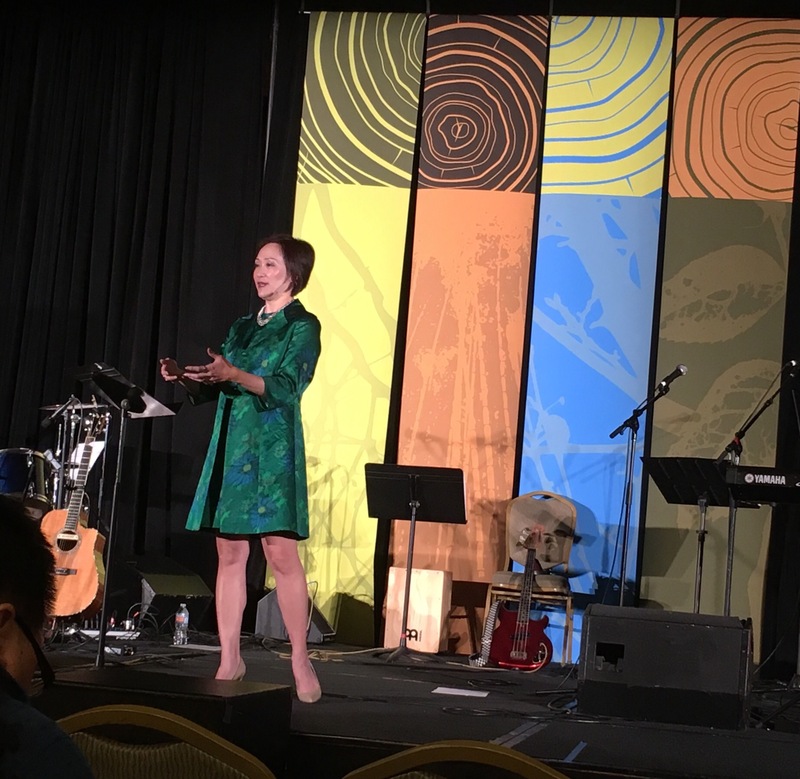 My husband and I left the Asian American church about seven years ago after a series of cultural and generational differences that lead to our decision to bless the mission of that particular church by leaving it. The decision was one of the most difficult and painful to make because it pulled at our identity as a Christian Korean-American family longing to integrate the very best of what we had gained from our immigrant church experience into our “grown-up” lives. Every now and then the Asian American church pulls at something, tugs at my heart, hits a nerve just under the surface. I wonder what, if anything, my three children are missing out on by not being a part of an Asian American church and youth group. I wonder how different my circle of friends would look like if we were still a part of an Asian American church, how our Sunday afternoons would be spent, and what a small group Bible study would be like. 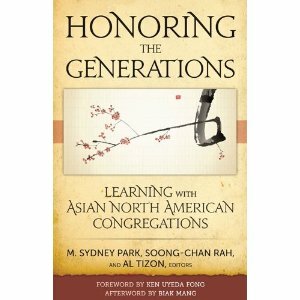 And then that wonder turns into a hint of longing for what was once familiar, and that is exactly what happened for me as I read Honoring the Generations:Learning with Asian North American Congregations (M. Sydney Park, Soong-Chan Rah, and Al Tizon, editors; Judson Press 2012). The stories of cultural and generational conflict and misunderstandings resonated deeply with me. I found myself nodding not to sleep but in agreement and affirmation, as if my nod would be felt by the authors and collaborators. Our ANA church history (is your church an art museum or a hospital? p.88) is important to understand and know, not just for those of us who lived and live it but for all in the Church. I found myself nodding because even when I wanted more (would it surprise you if I said I wanted more from chapter 6 on women and men leading together?) I hoped that non ANA church leaders would pick up the book and learn. Some of the chapters provide more concrete steps for ministry practitioners to take to help move ANA ministry forward. Others leave more space and ambiguity. My personal preference tends to want more concrete steps – something I can either agree with and implement or something I can disagree with and move on. The book is divided into two main sections covering the ANA church from a generational perspective and a ministry issue/strategy perspective. Each chapter covers a different topic, and each chapter is written by a pair of authors who are using information and stories gathered from a group of ministry practitioners and scholars. In true Asian American form, collaboration takes the lead in shaping this book. Readers may find this approach, this collaborative voice, both informative and frustrating. If you’re not familiar with the ANA church the stories will be new and informative, and they may be frustrating because they don’t fit in your paradigm and experience. Creating new categories aren’t easy when they are someone else’s story, particularly someone else you may have considered as “White” as Asian Americans have often been seen by the majority culture. But for me it was like singing a hymn in Korean. It tugs at my heart because the hard memories continue to soften with time, and there is a longing to continue learning despite having left. Full disclosure: I received an e-copy of the book for free from the publisher post-release to read and review for my blog.